About 33-35 species, mainly in Eurasia, two in North America. There are 21 species in the FSU, mainly in the Caucasus but also in the Far East, Central Asia and Siberia. All species are very attractive. Cultivars of P. lactiflora Pall. 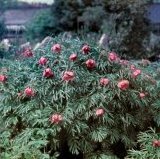 (Russian Far East) have been well-known in gardens for many centuries. European part of Russia (eastern regions), Siberia, Central Asia (Dzungarskiy Alatau, Tarbagatay, Tien Shan), northwestern China and Mongolia. Clearings in forests, meadows, slopes in the mountains. Taproot deep. Flowering stems 60-120 cm. Leaves biternate, segments lanceolate, entire. Flowers solitary, purple-pink, 8-15 cm diam. During the peak of the flowering period the flowers are very numerous, covering the entire bush. V - early spring to mid autumn, in St. Petersburg Fl - May, Fr - July. P - by division and by seed sown immediately in mid summer. Come into flower in 3-4 years after sowing. Tolerates partial shade, grows best on rich soil in sunny places. A very attractive species. In cultivation since 1788, however poorly known today. Z 4 (3). Closely related to this species are P. intermedia C. A. Mey., with bright red flowers and leaves with linear-lanceolate segments and P. hybrida Pall., with crimson-red flowers (7-9 cm diam.) and leaves with linear segments (3-5 mm wide). Both occur in Siberia and Central Asia, where hybrids between these three species can be found. Z 4 (3). New. Caucasus (western and central regions, Transcaucasus). Clearings in the mountain forests, meadows, from foothills up to subalpine zones. Taprooted plant with thick horizontal rhizome. Stem leafy, 70-100 cm. Leaves biternate, lobes elongate-ovate or elongate-elliptical with greyish wax and short sparse hairs beneath. Flowers large, single, 8-10 cm diam., bright crimson, sometimes pink. Ovary hairy, stigma and stamen filaments crimson. V - early spring to mid autumn. Fl - May. Fr - July-August. P - by fresh seed sown immediately in autumn or by division. Z 4. Crimea, northwestern Caucasus. Mountain forests, grassy slopes. Taprooted plant, with horizontal rhizome. Stem leafy, 60-100 cm. Leaves triternate, rounded, with wavy margins, with grey wax above and with short scant hair below. Flowers large, single, 7-10 cm in diam., pink. Ovaries, stigma and stamen filaments pink. V - early spring to mid autumn, in St. Petersburg April-September. Fl - May. Fr - August-September. P - by fresh seed and by division. 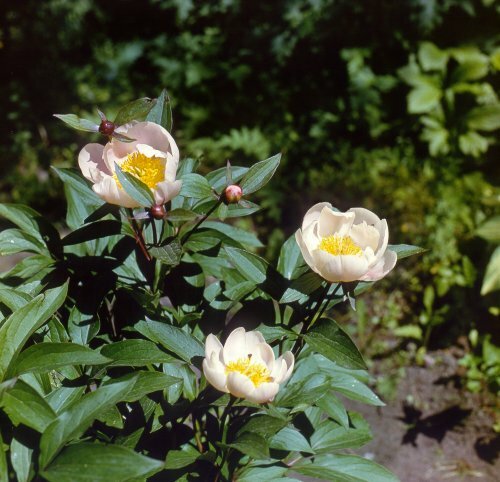 Plant in a sunny place on well-drained soil, can also grow in partial shade. Can grow many years in one place undisturbed. Z 4. Poorly known in cultivation. Siberia (Dahuria), Far East (southern regions), eastern Mongolia, China, Korea; naturalized in Japan. Open forest edges, stony slopes of subalpine zone. Taprooted plant with short horizontal rhizome. Leafy stem, 70-100 cm or more. Leaves biternate, with lanceolate or elliptical lobes. Flowers large, 10-18 cm diam., white, pink or red. V - early spring to mid autumn, in St. Petersburg May-September. Fl - May-June for 2-3 weeks. Fr - July-August. P - by seed or by division. Plant in full sun, on well-drained soil. 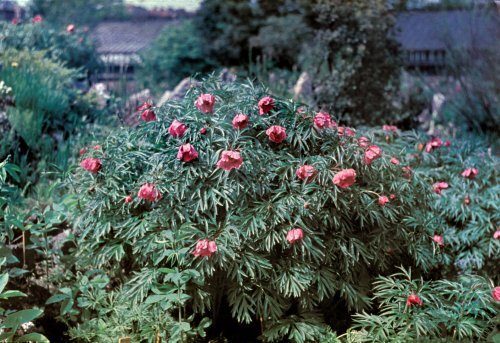 The majority of peony cultivars represent the results of selection in this species. Z 4. Taprooted plant, with short horizontal rhizome. Leafy stems 100-120 cm. Leaves biternate, lobes obovate and elongate-ovate, long-cuneate at base. Leaf blade smooth above, with sparse thin hairs along veins, or rugose above with dense long hairs, greyish. Flowers large, 8-14 cm diam., bright or pale yellow. Ovary glabrous, stigma and stamen filaments dark red. V - early spring to mid autumn, in St. Petersburg April-September. Fl - May for 2-3 weeks. Fr - July. Plant in sunny places on well-drained soil. Z 4. Caucasus (Lagodekhi Reserve, Dagestan). Mountain forests, stony slopes in middle and upper mountain zones. Taprooted plant, 80-100 cm. Leaves biternate, lobes obovate, light blue due to wax cover, densely pubescent between veins. Flower 10-12 cm diam., yellow, ovary pubescent, stigma white-pink, stamen filaments yellow-green. V - early spring to mid autumn, in St. Petersburg April-September. Fl - May-June. Fr - July-August. P - by seed and division. Prefers a sunny position, however tolerates partial shade. A very attractive species. Z 4. Southern regions of European part of the FSU, Caucasus, Central Europe and the Balkan Peninsula. In steppes, among shrubs on slopes. Taprooted plant with leafy stems 50-70 cm. Leaves dark green, bi-triternate, lobes narrow, sometimes filiform or linear. Flowers dark red, large, 3-5(8) cm diam. Ovary pubescent, stigma and stamen filaments dark red. V - early spring to mid autumn, in St. Petersburg April-September. Fl - June for two weeks. Fr - July. P - by seed and by division. Tolerates partial shade. Cultivation very easy. Z 4 (3). Caucasus (Abkhazia). Mountain forests, clearings. Taprooted plant, with leafy stem 80-100 cm. Leaves bi- or -triternate, lobes ovate, long-cuneate at base, bright green on both sides, with slight pubescent beneath. Flowers 7-8 cm diam., creamy. Ovary pubescent, stigma and stamen filaments dark red. V - early spring to mid autumn, in St. Petersburg April-October. Fl - May-June. Fr - August. 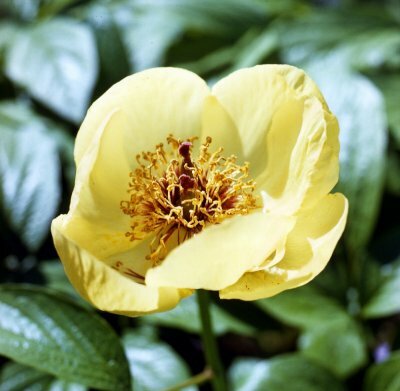 Tolerates partial shade, does well in full sun on well-drained soil. Z 4. There are two other species with yellow flowers, unknown in cultivation, both native to the Caucasus. P. steveniana Kem.-Nath. Plants 70-90 cm, flowers lemon yellow, half open. Fl - May. Z 4 (3). P. tomentosa (Lomak.) N. Busch. Plants 50-90 cm, flowers large pale yellow. Fl - early May. Very ornamental. Z 4 (3). Russian botanists accept also some other Caucasian species, such as red-flowered once: P. biebersteiniana Rupr., P. carthalinica Ketsk., P. majko Ketsk. and P. ruprechtiana Kem.-Nath., also pink-flowered P. lagodechiana Kem.-Nath. Some of these species are probably of hybrid origin. All are of horticultural value. P. cartalinica, with bright red flowers and leaves with narrow linear lobes closed very much to P. tenuifolia; and P. majko, with large, red flowers and bi-triternate leaves are especially attractive. Both occur in Georgia.